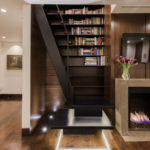 Fire, Earth, Water and Wind - Kurt Krueger Architects, Inc. 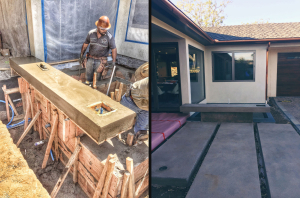 This week we are featuring some design elements of the recently completed Sunset, Pacific Palisades Project. 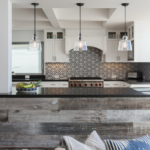 The homeowners wanted a modern style home, but wanted it to feel warm and inviting, will using premium materials to create a sophisticated space perfect for their lifestyle. On the entry porch, we set a tree in the center of a water feature. The planter is surrounded by water and at night is up-lit from small puck lights just below the water line. On the outside edge of the water we included a floating concrete bench and placed a fire feature on the corner edge. We used a maple tree we knew would grow over the years and mature into lush landscaping. The front courtyard is screened subtly from the drive by a hedge of tall grasses. 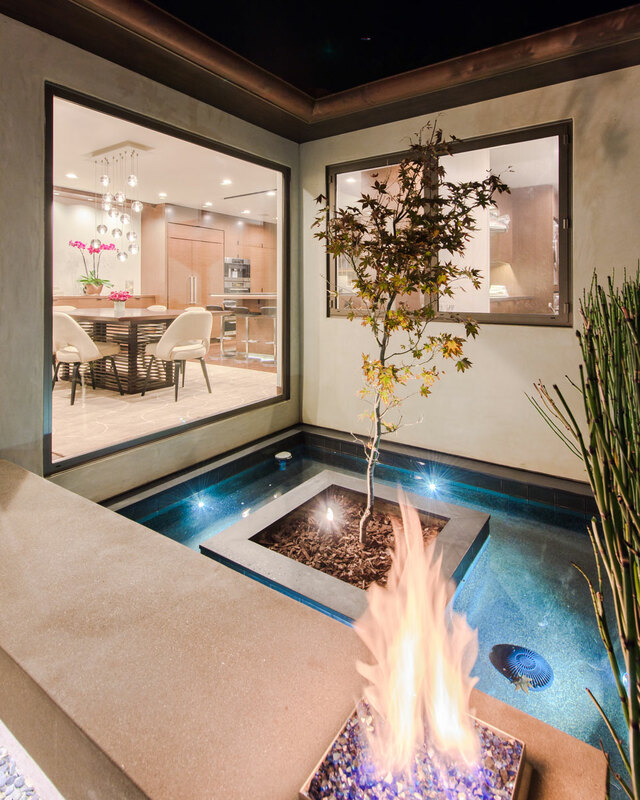 When the flame is lite and the water cascades from outside the back edge of the floating bench, you have a peaceful, and welcoming front entryway. To mediate and buffer the noise of their very busy street, we screened off the exterior and planted a high hedge. 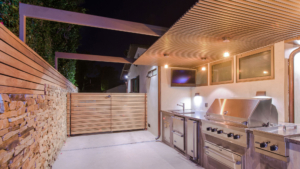 In the side yard, to create privacy, we topped stone walls with horizontal wood slats and fabricated steel into a simple trellis system to visually define the space used for the outdoor kitchen. The stone wall is continued into the backyard oasis. At the rear of the yard, a bank of tall trees screens the in ground pool and hot tub. A lesser height stone wall creates a border in front of the trees and unifies the entire yard. 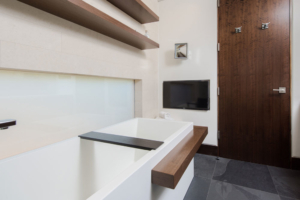 In the master bathroom, our design used a free-standing tub with a wood ledge piece that wraps around the tub, achieving a floating effect similar to the outside water feature. The clients wanted to look out a horizontal window to a Zen garden from the tub. Obviously they didn’t want their gardeners to see into the bathroom…and did not want ugly blinds. Our solution was polarized glass. You click a button and you cannot see out, nor can anyone see in — the material goes from a clear to a frosted look. This is sophisticated alternative to typical frosted window films. 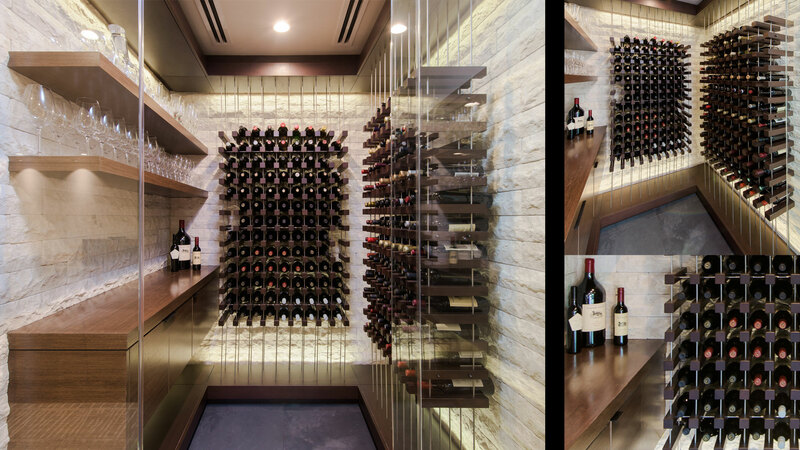 Custom designed wine storage room with Wenge Wood and suspended wine storage. An alcove at the side of the living room has been glassed off to be used as a spot for the wine collection. The room is a mix of metal, wood, and stone. Recessed backlighting washes the three Jerusalem stone walls. The wine racks have been created using thin metal rods that vertically bisects pieces of Wenge wood. The Wenge was also used as shelving in the wine room. Friends have remarked, “Wow, this delicate structure supports those heavy bottles …” A typical architect may have trouble with a design feature like this, but as a design-build architecture firm, we were easily able to design, engineer, and build this unique, showpiece of art that a first glance may seem too delicate to hold all of the weight of the bottles, but it is solidly built to endure. The Jerusalem stone was also used on the wall of the center hallway which separates the living room from the more private family spaces. Floor lights were inset in the wood floor and cast a soft light on the stone. In the master bath, the same stone was also used behind the floating vanity. 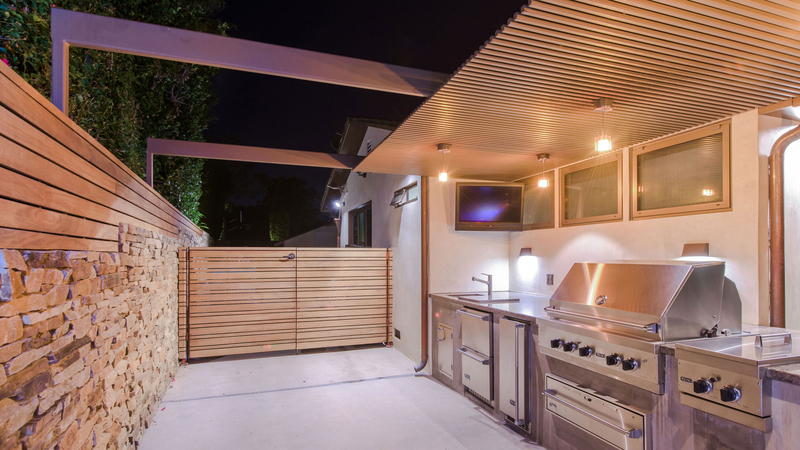 Read more about this project in our Portfolio section, Sunset, Pacific Palisades.